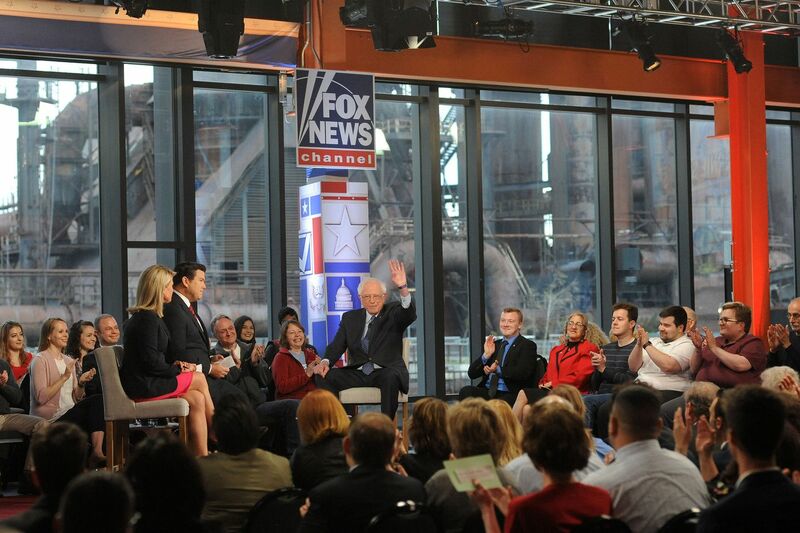 Democratic presidential candidate Bernie Sanders (right) waves as he answers questions from Fox News' Martha MacCallum (left) and Brett Baier (Center) during a Town Hall Meeting Monday, April 15, 2019 at Steel Stacks Event Center in Bethlehem, Pennsylvania. WILLIAM THOMAS CAIN / For The Inquirer. BETHLEHEM, Pa. — Sen. Bernie Sanders on Monday defended the book sales that helped him become a millionaire, declaring at a town-hall style forum hosted by Fox News that he would not apologize for his success. “If anyone thinks I should apologize for writing a bestselling book, I’m sorry, I’m not going to do it,” the Democratic presidential candidate said at the hour-long event Monday night at the ArtsQuest center at the SteelStacks, in front of the old Bethlehem Steel plant. The town hall came the same day Sanders (Ind., Vt.) and his wife released 10 years of tax returns, which showed they had an adjusted gross income that exceeded $1 million in 2016 and 2017. Their most recent tax return showed adjusted gross income of $561,293. Sanders’ appearance followed a weekend swing through Pennsylvania and Midwestern battleground states that helped deliver Donald Trump the presidency. Trump’s success in 2016 among white, working-class voters in longtime Democratic areas like this was seen as critical to his razor-thin wins there. Northampton County, home to Bethlehem, was one of three counties that voted for Barack Obama in 2012 and swung to the Republican four years later. The Fox News stage was set against the backdrop of five towering blast furnaces that serve as a reminder of the company that powered the local economy for decades until the plant closed in 1995. Over the years it has been replaced by a casino and arts venue. But the interest in Sanders’ tax returns animated much of the evening. He tangled with Fox News moderators Bret Baier and Martha MacCallum, acknowledging that he benefited from Trump’s tax cuts but noting that he voted against the legislation. Growing dismissive of the line of questioning, he told Baier: “Why don’t you get Donald Trump up here and ask him how much he pays in taxes?” Then he sought out an audience at the White House. “I guess the president watches your network a little bit,” Sanders said. “Hey, President Trump, my wife and I just released 10 years. Please do the same." The Democratic-controlled House has demanded that the Treasury Department turn over six years of Trump’s taxes. That Sanders would even appear on Fox News was controversial on the left, with some activists arguing that Democratic presidential candidates shouldn’t engage with a network they say has acted as a booster for Trump and fostered intolerance toward minority groups. He argued his signature “Medicare for All” proposal would pay for itself and cost less than the current system because it would eliminate out-of-pocket costs. And he dismissed think tanks that have questioned whether the math would add up. “Check out who funds the think tanks,” he said, adding that his campaign was taking on corporate America, Republicans, the Democratic establishment, drug companies, and the military industrial complex. Sanders has raised more than $18 million for his second presidential campaign, by far the most of any candidate seeking the Democratic nomination. Though he was cheered enthusiastically by a friendly audience here, some of the president’s supporters showed up to protest outside. About 90 minutes before the town hall began, a few dozen Trump supporters gathered outside the venue holding “Make America Great Again” signs and chanting “USA! USA!” Nearby, a man drove around in a cement mixer emblazoned with the American flag and the “MAGA” slogan.